I love to ride my scooter. Sometimes I write. Sometimes I take photos. Activists want Ald. Danny Solis to reconsider supporting a proposed metal shredding facility across the street from Benito Juarez Community Academy. Pure Metal Recycling wants to build a $30 million metal shredding facility on 15 acres of land near Cermak Road and Loomis Street, next to the South Branch of the Chicago River. 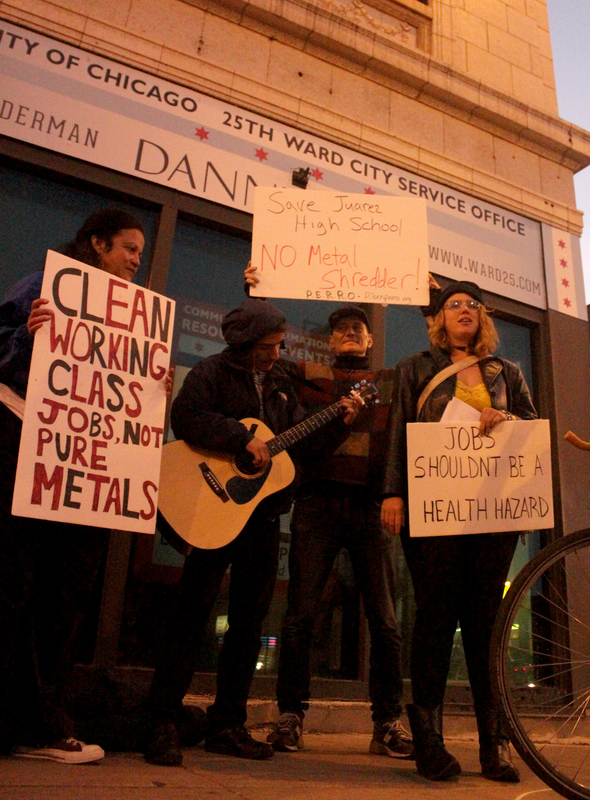 Citing environmental pollution to the air and water and traffic congestion, the Pilsen Environmental Rights and Reform Organization (PERRO) sent a letter asking Solis to withdraw his support for Pure Metals and the facility from being built in Pilsen last Wednesday. As EXTRA previously reported, the city’s Zoning Board of Appeals Committee approved the request for Pure Metals to build the facility back in February. At the time, Solis submitted a letter in support of the facility. Pure Metal’s principal owner, Brett Baron, is the son of Bridgeport-based Acme Metal Refinery President Larry Baron. Last year, agents with the Internal Revenue Service’s Criminal Investigation Division raided Acme’s offices at 3357 S. Justine St. as part of an ongoing investigation. While no charges were filed, news broke that 25th Ward Regular Democratic Organization, headed by Solis, accepted a total of $32,500 from Acme. Solis has been silent on the proposed shredding facility since Pure Metals won its special use permit from the zoning board. He said that since childhood he’s had to deal with asthma and says the pollutants from Fisk likely contributed to his respiratory problems. However, he noted, if the facility brought jobs to the neighborhood, Pilsen would be the better for it. “It’s a good idea for jobs, but it’s just a bad location,” said Martinez. The Pilsen organization Centro Sin Fronteras said PERRO’s environmental worries are being overstated. “They will be the cleanest facility in Pilsen and operate on European environmental standards,” said a release from the organization given to EXTRA. Centro said it believes the jobs Pure Metal could bring to Pilsen will help the community keep its unique identity and help push back the gentrifying forces that have targeted the neighborhood over the last decade. Moreover, Centro said the competition Pure Metal will create with a nearby metal shredding facility, Sims Metal Management at 2500 S. Paulina St., will benefit the neighborhood. Regardless, Pure Metal must still go before the Illinois Environmental Protection Agency to get further approval for their proposed facility.